The SD9362-EHL is a high performance 2MP PTZ camera armed with a 30x optical zoom lens which is capable of capturing fine details. 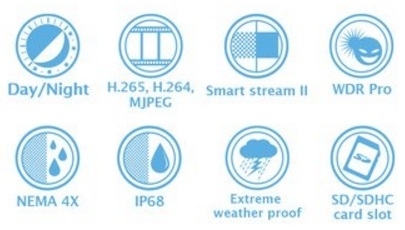 This camera uses both Smart Stream II and H.265 technology to optimize quality and maximize bandwidth usage and storage consumption. The SD9362-EHL is also equipped with wide dynamic range pro and can record up to 60fps offering excellent quality in all light intensities. Using IP68 rated weatherproof housing and IK10 rated vandal proof housing, this PTZ is the perfect choice for outdoor applications.